We’re really excited to have you on board, and can’t wait to help you get started. We’ve created this step-by-step guide to introduce you to our platform and walk you through our setup process. If at any time you have questions or need help, simply drop us a line here. To make the most out of Podia, you’ll want to do a few things to set yourself up for success. They’re simple steps — and will only take a few minutes — but completing them now will make creating and selling a lot easier. Just like a brick-and-mortar store, your Storefront is the first thing your audience will see. It’s also where your Online Courses, Membership and Digital Downloads will appear (unless you choose to hide them). Go to the Settings of your account to fill in details like your Storefront name. To add a tagline and any website or social media links you want your visitors to know about be sure to check out the Editor. Check out our Storefront to see what it looks like after it's been built out and ready for sales. Once your Storefront is setup, let’s put something on the shelf for your visitors to buy! 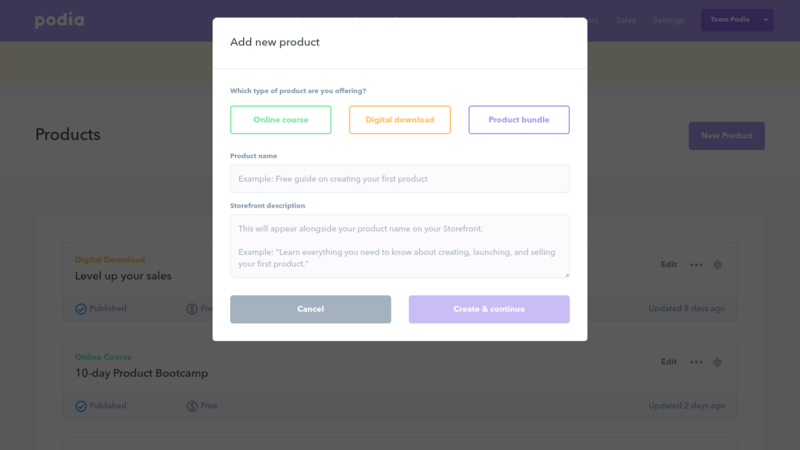 Go to the Products Section to create your first Online Course or Digital Download (for example, an eBook, PDF or worksheet), or Product bundle. To start with a Membership website go to Memberships at the top of the dashboard. 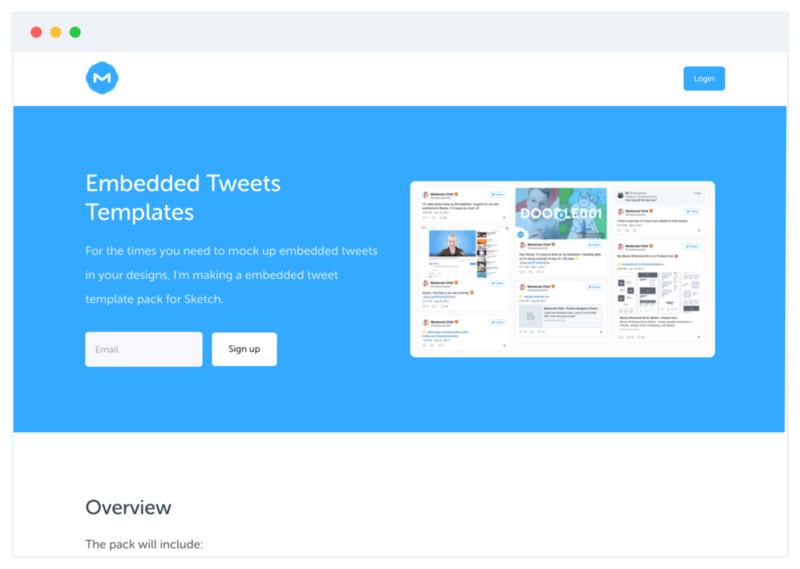 If you already have existing content, you can simply drop it into the editor (or let us migrate it for you!). 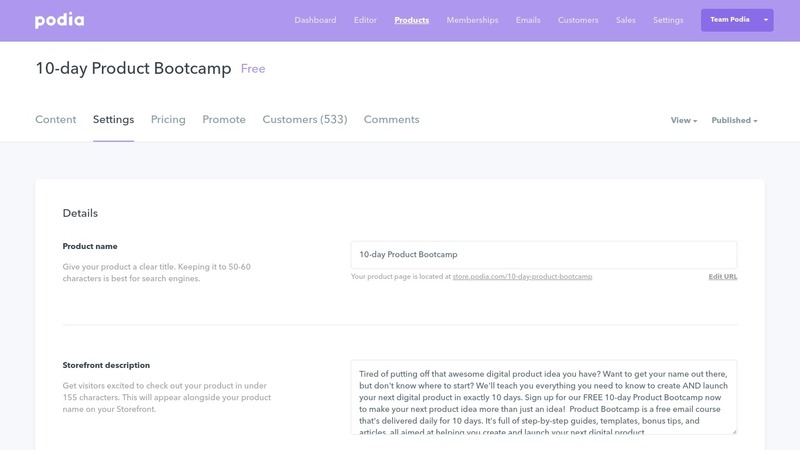 Need some help getting started with your first product? Check out our article on creating an online course using Podia; it’s packed with helpful tips on making your course as irresistible as possible. Once you’re ready to sell, just switch the product setting to “Published”. Choose Pre-Launch mode to start gathering email addresses from interested prospects before you launch your product. You’ll also want to create a sales page for your product, to let your prospects know what they’re signing up for. 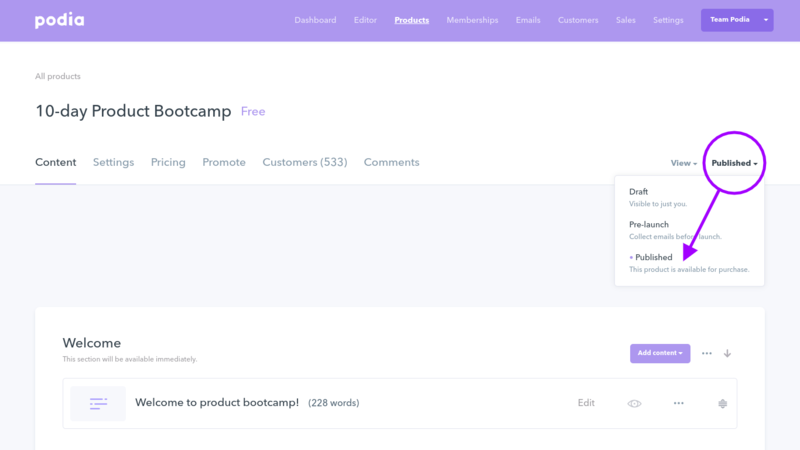 Here you’ll be able to hide your product from your Storefront, Add a course Start date, Close Enrollments and add Integrations. For tips on writing a killer sales page that your prospects won’t be able to say ‘no’ to, check out our complete guide on the topic. Once your product is ready, let’s start selling it! When it comes to selling your course, your email list is your number one most valuable sales asset. If you’re starting from scratch, no problem! We’re here to help. For some inspiration, check out these tips we’ve put together for building your email list. 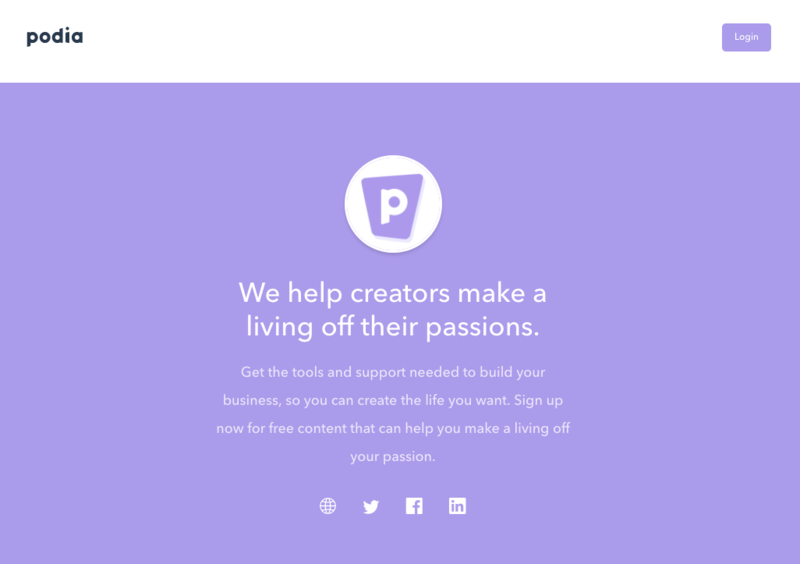 If you have an existing list of subscribers or customers, you can import them into Podia. 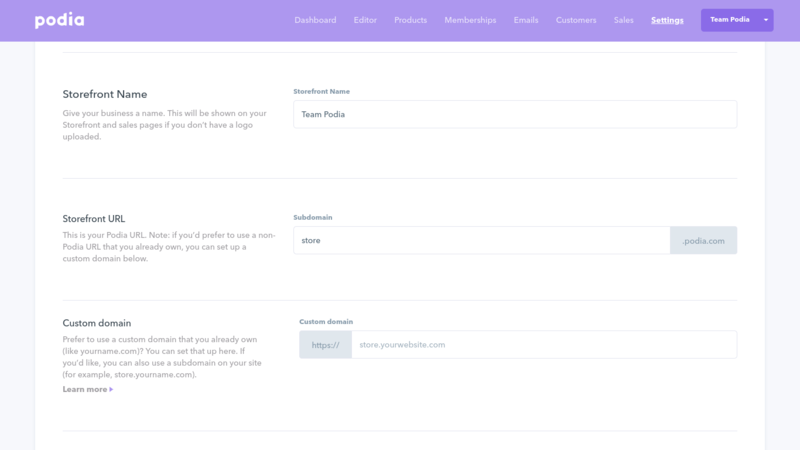 Collect email addresses with a sign-up form on your Podia Storefront, Pre-Launch Product, or add a Newsletter directly into your Products pages. As your list grows, you can engage with your biggest fans using Podia’s Newsletters feature. Newsletters are emails filled with helpful content, tips, and new products, and they're a great way to build trust and loyalty among your audience. If you’ve never created an email newsletter, we’d recommend checking out our step-by-step email marketing guide. Once your online business is up and running, you may want to consider adding an automated drip campaign into your approach. A drip campaign is a series of emails that automatically goes out over a period of time to your subscribers. You can send them to all new subscribers, or to a segment of subscribers based on their behavior (for example, those who purchased a particular product). To get started, all you have to do is select a “trigger” that will send the campaign (either a new email signup or a product sale), write your messages, and turn the drip campaign on. We’ve put together a guide to automated email campaigns that includes word-for-word templates that you can use to nurture your subscribers toward a sale: check it out here. 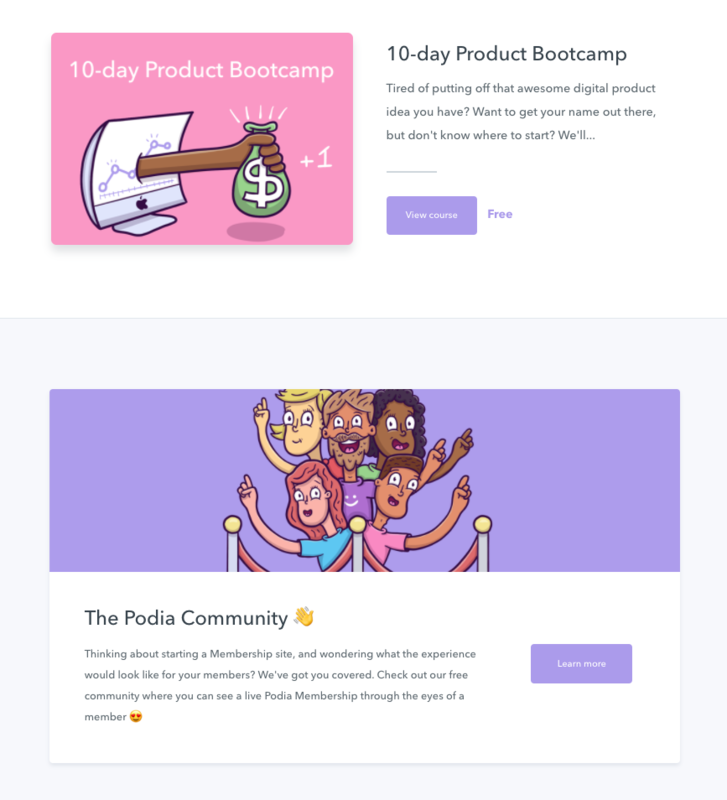 At every step of the way, Podia offers you valuable data to help you make better decisions about which products to build and what emails to send. …and a sales dashboard that breaks down your performance by product. By identifying your highest-performing products, you’ll be able to shape your product and marketing strategy and keep your online business growing! Ready to earn 💰 from your passion? We’re excited to help you get started. If you ever need anything at all, you can always reach our Creative Support Team by clicking on the chat icon in the bottom right of your screen, or emailing us at [email protected]. From all of us at Podia, welcome!